Margaret Thatcher, the first woman ever to serve as prime minister of Great Britain and the longest-serving British prime minister of the 20th century has died at age 87. "It is with great sadness that Mark and Carol Thatcher announced that their mother Baroness Thatcher died peacefully following a stroke this morning," Lord Timothy Bell said today. "A further statement will be made later." In Dec. 2012, she was underwent an operation to remove a bladder growth, longtime adviser Tim Bell told The Associated Press. But during her long career on the political stage, Thatcher was known as the Iron Lady. She led Great Britain as Prime Minister from 1979 to 1990, a champion of free-market policies and adversary of the Soviet Union. Many considered her Britain's Ronald Reagan. In fact, Reagan and Thatcher were political soul mates. Reagan called her the "best man in England" and she called him "the second most important man in my life." The two shared a hatred of communism and a passion for small government. What America knew as "Reaganomics" is still called "Thatcherism" in Britain. Like Reagan, Thatcher was an outsider in the old boys' club. Just as it was unlikely for an actor to lead the Republicans, the party of Lincoln, it was unthinkable that a grocer's daughter could lead the Conservatives, the party of Churchill and William Pitt -- that is, until Thatcher. 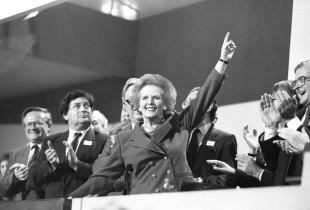 She led the Conservatives from 1975 to 1990, the only woman ever to do so. Thatcher was born Margaret Hilda Roberts on Oct. 13, 1925 in Grantham, England. She attended Somerville College, Oxford, where she studied chemistry, and later, in 1953, qualified as a barrister, specializing in tax issues. She pushed for privatization, lower taxes, and deregulation. And she sought to keep Britain from surrendering any of its sovereignty to the European Union. Thatcher's admirers say she rejuvenated Britain's faltering economy. Her critics say the rich got richer and the poor were left behind. In the inner cities, Thatcherism brought a violent backlash. There were calls from her own party to change course. But Thatcher resisted. "You turn if you want to," she said in October 1980. "The lady's not for turning." She had courage in abundance. In 1982, when Argentina invaded the Falkland Islands, she took Britain to war -- and won. In 1984, she narrowly escaped being killed when the IRA bombed her hotel during a party conference. The morning after, she convened the conference on schedule -- undaunted. "As the last journey of this faithful pilgrim took him beyond the sunset, and as heaven's morning broke, I like to think -- in the words of Bunyan -- that 'all the trumpets sounded on the other side," she said.